Hunters and outdoor retailers continue to talk about a new hunting blind with surround view. Many, including avid hunter and outdoor writer Bob Robb, consider it a game changer. These days there are very few new products that I would actually call a “game changer.” Many are truthfully nothing more than a twist on an old idea or a slight improvement over something already available. When I first saw the new Primos Double Bull SurroundView hunting blinds at the January trade shows, I instantly said to myself, “game changer.” When I was able to hunt Axis deer in south Texas from one with a rifle in June, my opinion didn’t change. Since then I’ve had one at home and have been playing with it a lot in anticipation of some summer bow hunts. All I can say is, it’s something else. If you’re familiar with Double Bull pop-up blinds, then you need no convincing of their ruggedness and an interior configuration that's design is one that's well thought-out by hunters. My only beef with Double Bull blinds over the years is that, while their hub-and-pole system makes them solid as a rock once erected, putting up and taking the blinds down can be a bit of a challenge until you both get used to it and the blind’s fabric has a chance to stretch a little bit. Not an insurmountable problem but, for that reason, you need to practice in the garage before heading afield with one. 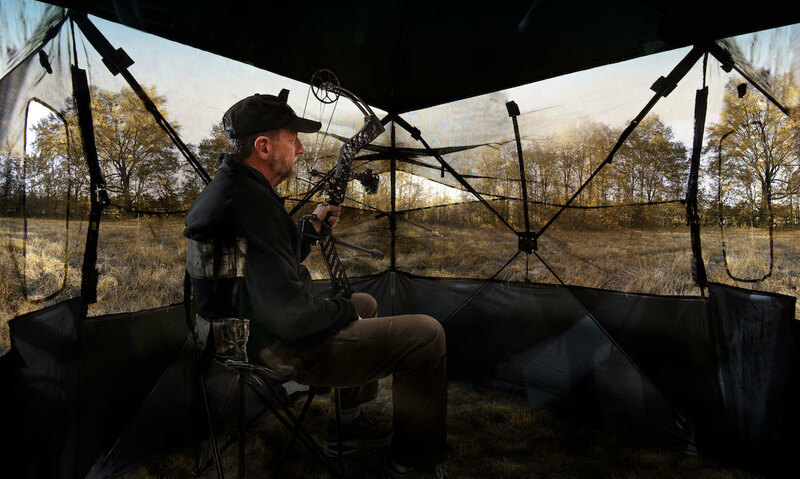 Once you get a SurroundView blind up and sit down inside, you immediately see why Primos touts it as the “Blind Without A Blind Spot.” Thanks to the exclusive, one-way see-through walls that allow hunters to see all surroundings without being seen, you now can spot all the movement you missed with traditional blinds featuring solid walls and opaque windows. All the while, the hunter remains just as concealed in the surround view blind. It’s like looking through a one-way mirror! Jacob Edson, a spokesman for Primos who was hunting with us in Texas, told me that the fine window mesh blocks virtually all wind and also contains 98 percent of human scent as well. Like a closed window, you cannot shoot through the mesh. But the blinds have plenty of large, well-spaced shooting windows making the mesh a non-issue for either a firearms or archery hunter. There are three models available. The 360 comes with four one-way, see-through walls with one movable black out wall to place on any wall you choose. It measures 60x60 inches, is 70 inches tall, and weighs 23 pounds with the carry bag. Two people can easily hunt from this blind. The 270 — the model I hunted from and have at home — comes with three one-way, see-through walls and one rear blackout wall. It measures 55x55 inches, is 70 inches tall, and weighs 21 pounds with carry bag. Two people can squeeze into this blind. The 180 comes with two one-way, see-through walls and two rear blackout walls. It measures 48x48 inches, is 65 inches tall and weighs 19 pounds with carry bag. It’s a one-man blind. The blind also features TRUTH camouflage specifically designed to hide ground blinds in any terrain. A limited lifetime warranty comes with each blind. You really have to sit in one of these blinds at your local dealer to truly understand how amazing they are. MSRP is $499.99 for the 360, $399.99 for the 270, and $299.99 for the 180. More information is available here. You can also check out the video clip below to get a good idea of what you can see from inside one of these blinds.